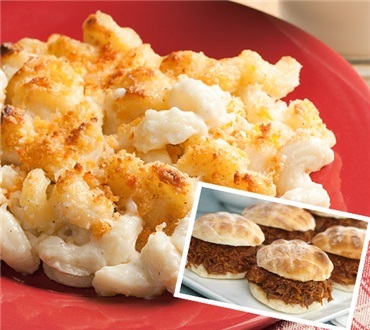 Both our sweet and tender pulled pork and special Vermont mac and cheese come fully cooked; just warm and serve. Our own special variety of pulled pork is marinated in the same sauce as our popular back ribs for the same great taste without the bones. Perfect on its own or for topping your favorite bun. Made with Cabot Extra Sharp Cheddar and Dakin Farm ingredients our Mac N Cheese is different than any you've tasted before. Plus, it all began with Grandma Joan Cutting's recipe! You'll enjoy smooth, creamy Mac N Cheese with a panko bread crumb topping. The Smoked Ham and Bacon blends add just the right amount of our signature smoky flavor.